Are you looking for an inexpensive way to create student identification cards? Our Student identification card template provides security and identification for your students without spending a large sum of money. This template is available for free, completely customizable, and very easy to use. It can be used over and over, so you can create an identification card for every student. Our student identification card template will save your school a tremendous amount of money, while offering a quality product. This template is available to download at not charge here. Also, each card can be customized with the school name, address, phone number, and emergency contact information. All you have to do is personalize it with your school information. Our template provides an excellent student identification card, that is very easy to use. It can be downloaded right now! When the template has been downloaded, you can begin customizing your student identification cards right away. You can easily add a picture to the student identification card by right clicking on the example picture, then select the change picture option. You can add a picture from your computer to the card. This identification card is formatted, so you can add the school name, address, phone number, in case of emergency information, student name, and identification number. Also, you can add any additional information your school requires or remove any unnecessary information from the card. This template was created with simplicity and effectiveness in mind. You can easily personalize this template by simply double clicking the section of the card you would like to customize. 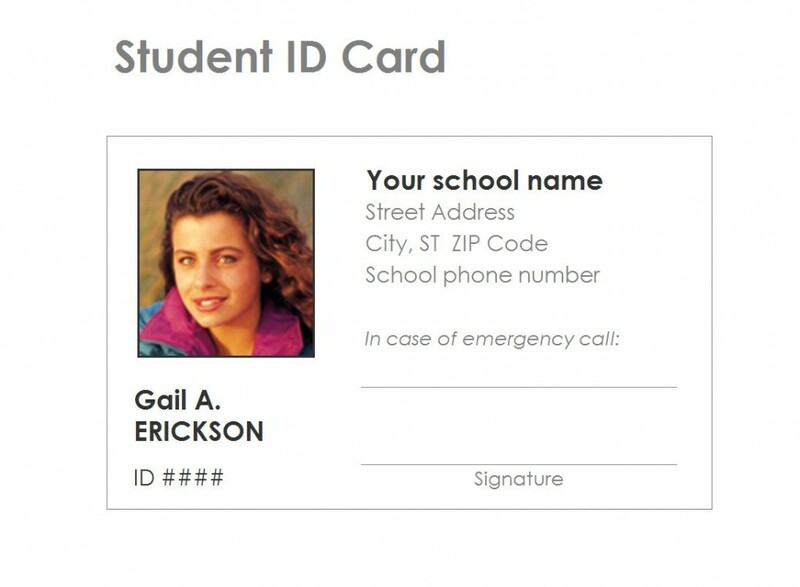 Our template allows you to personalize each identification card with a picture of the student. The quickest and easiest way to add a picture to the card of each student is to have a file on your computer that contains a picture of each student. For a sturdy and durable student identification card, this template allows you to print your identification cards on card stock paper.